I am headed to Barcelona next week to attend an international seminar called “War Profiteers and Peace Movement Responses.” The meeting is being organized by War Resisters International, the Spanish organization Foundation for Peace and others. Besides my obvious excitement about mi viaje a España, I am looking forward to being part of a discussion on the costs of war and the work for peace involving activists and analysts from all over the world—from South Africa to Venezuela and many places in between. As the occupation of Wall Street continues, and Wall Street itself falters, and the tenth year of war in Afghanistan approaches, it is a good time to address these issues in a sober and head on way. How do we make the connections between the costs of war and the price of peace? How do we help our communities move from understanding, to outrage, to action, and how do we make those actions meaningful, strategic and impactful? I definitely don’t have all the answers. Or even any of them… but those are the questions I am asking as I pack my bolsas and practicar mi español. One of my presentations is a “how to” on researching the arms trade. I am pretty computer illiterate, but I hope to work with more tech savvy colleagues at the War Resisters League and Fellowship of Reconciliation’s Militarism Watch to turn it into a “webinar” (as the kids say, please… tell me that the kids still talk about webinars, that we have not turned a corner away from that innovation). Here are a few factoids that the presentation will help would-be researchers uncover. In 2009 (the last year for which there is full data—unbelievable, right? ), the Pentagon made agreements to sell weapons and military hardware worth $30,660,936,000. Arms buyers around the world took delivery of weapons worth $12,521,676,000. Why the difference? Sometimes, the Pentagon and arms buyers agree to buy more than the country can really afford, or they stretch the buying over a number of years. It was an interesting year in terms of weapons deliveries. Only two nations took delivery of more than $1 billion in weapons… a sign of a strapped economy if I ever saw one. The first was Saudi Arabia (a consistent big spender) at $1.7 billion in weapons and military hardware and the other was Greece (which most often buys more like a few $100 million in weapons) with $1.2 billion. Greece is in the news because its economy is getting flushed down the toilet—it is on the verge of a default and Athens is considering cutting the national budget by 50 percent. Like in half… In response to these proposals, the Greek public transport system ground to a halt on Thursday, with bus drivers, train conductors, cabbies and even air traffic controllers striking in protest. Even as it lays off workers, raises taxes and cuts pensions in an attempt to get its economy back on track; Greece is spending billions on weapons. In 2005, the Pentagon notified Congress about an agreement with Greece for a whopping $3.1 billion in weapons, including F-16 fighter planes. Because it takes a few years for a deal this big to get finalized, this year Greece has begun to exercise that license. 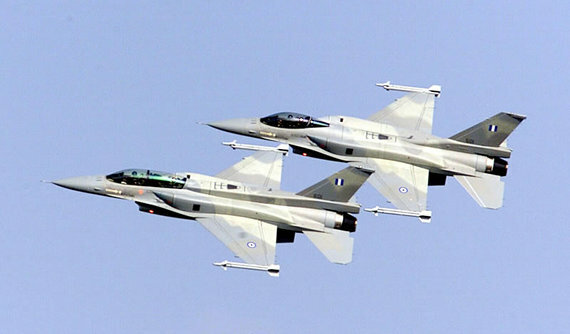 In March and April, Greece made deals worth a cumulative $260 million for spare parts and equipment for its air force. Are the protesters flooding Athens and other Greek cities decrying their country’s arms buying spree? Are they talking about their military budget? Greece spends more than 4 percent of GDP on the military, according to the CIA’s World Factbook, making it 22nd in the world, ahead of China (23rd) and the United States (24th). Those are 2005 and 2006 figures, but they are still pretty interesting, right? Closer to home, Robert Greenwald and others are trying to make U.S. military spending part of the conversation about the U.S. economic crisis. I think it is penetrating, but not as much as it needs to. How do we take it to the next level? How do we inform and educate and organize and mobilize? How do we change the system and our lives? Big questions for a big time! More when I get back from Barcelona! Enjoy your time in Barcelona. It’s a fabulous city and don’t turn down offers to see its charms. If you can get to the Basque quarters, do so. I think that sometimes in our quest for “solidarity” we lose sight of our values. I’ve seen too many “costs of war” conferences that are all about economic costs. Moral costs are all but abandoned in our quest for “allies”. There are costs that are immeasurable (the destruction of our humanity, the destruction of our homes). I think these costs cannot/should not be quantified; by trying to do so you accept the paradigm that everything has a price. If you could wage a war and keep a balanced budget, would that be alright? I do not use “should not” lightly. To me, a should is non-negotiable.